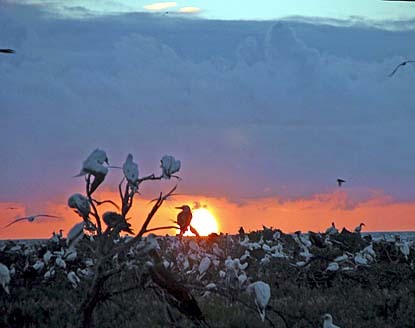 Sunrise on Tern Island highlights these red-footed boobies, a species that prefers perching on bare branches. Hundreds of thousands of seabirds breed on the 37-acre island, a man-made biological field station in the Hawaiian Islands National Wildlife Refuge. When Cari Eggleston showed her family an aerial picture of Tern Island, her father looked at her in disbelief and said, "Why would you ever want to go there?" It's a good question. From the air, Tern Island looks like no more than a gleaming white runway in a dreamy turquoise sea. For those with a little more imagination, the 34-acre island, with buildings on its west end and waves breaking on its east end, looks like an aircraft carrier going at full speed. But if the island is a ship, it's no military vessel. As the main biological field station of the Hawaiian Islands National Wildlife Refuge, Tern Island is more of a Noah's Ark. This 34-acre strip of land is the heart and soul of Hawaii's protected marine animals. As the small plane that brings workers to the island descends, it's clear that this island is more than an airstrip and that it belongs to the birds. The sound of the plane causes seabirds to rise up like a swarm of giant bees, and occasionally, some collide with the plane's propellers. These landings and takeoffs are white-knuckle events for both passengers and onlookers. 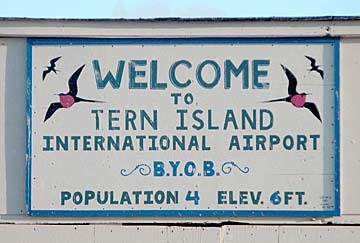 But pilot Bob Justman has made about 600 round trips to Tern Island in his Piper Aztec with no accidents. "At the Kauai airport they warn you about birds on the runway," he says. "They don't know birds on the runway." Workers at French Frigate Shoals live in this U-shaped building, a former Coast Guard barracks. 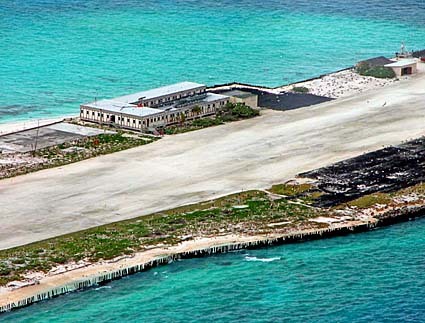 The runway, in foreground, stretches the length of the island. The rest of the land and surrounding waters belong to the wildlife. Upon landing, new arrivals immediately notice the Tern Island tang, and when the copilot opens the door, the odor hits full force. In its 61 years of existence, Tern Island has accumulated enough guano to wrinkle even the most seasoned biologists' noses. Of this reek, U.S. Fish and Wildlife Service biologist, Chris Eggleston said, "You get used to it. When someone new mentions the smell, I think, 'Smell? What smell?' "
Although Tern's coral rock runway is the dominant feature of the island, there's more down the sides of the island than first meets the eye. The runway takes up about half the island, but the other half, split roughly in quarters down each side, provides breeding and resting places for thousands of seabirds, hundreds of turtles and dozens of Hawaiian monk seals. Tern is the largest of several tiny islands in the atoll called French Frigate Shoals. These sandy bits of land, which with Tern total about 70 acres, provide even more secluded spots for breeding. On 11-acre East Island, Hawaii's green sea turtles lay eggs over nearly the entire island. Other islets also host fertile turtles and all beaches in the atoll are havens for the critically endangered Hawaiian monk seals. U.S. 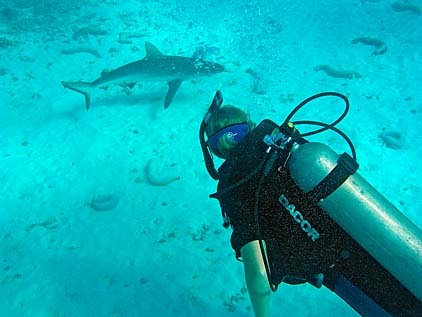 Fish and Wildlife volunteer biologist Christy Hand, above, watches a gray reef shark swim by in waters off Tern Island. Sharks are a common sight in this wildlife refuge, but no attacks on humans have been recorded there. French Frigate Shoals lies about 550 miles northwest of Oahu. This remoteness is one of the factors that makes the atoll a good wildlife refuge, and it is the wildlife here that attracts people. 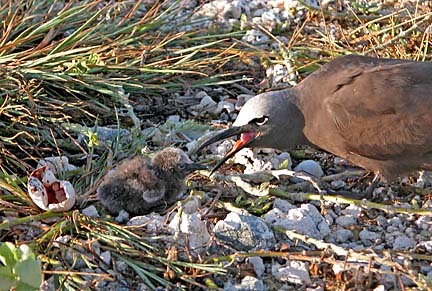 Most are biologists who come to Tern Island to monitor, study and help protect these animals. "I sent pictures home and my family was really disappointed," says FWS biologist Cari Eggleston. "My mom said, 'There aren't any people in your pictures.' 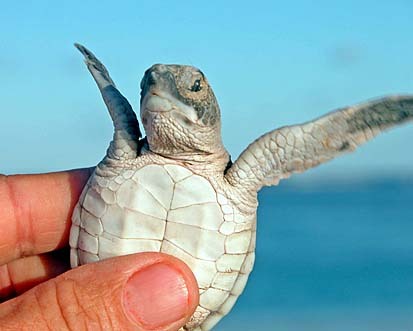 All my photos were of birds, seals and turtles." Employees and volunteers who manage and maintain the island work for the U.S. Fish and Wildlife Service. Mandates for the refuge come from Washington, D.C., and from the regional office in Portland, Ore. Managers in Honolulu and on Tern Island provide direction locally, and with the help of volunteers carry out day-to-day operations on the island and in the atoll. Since this is one of the few places left in the world where several of Hawaii's marine species can breed without disturbance, human traffic to Tern Island is strictly regulated. Traffic is also regulated on the island itself. "The beaches here belong to the animals," Chris Eggleston explains. Biologists from the National Marine Fisheries Service, the agency that shares responsibility with FWS for Hawaii's threatened sea turtles and endangered monk seals, also live and work on the island during the summer breeding season. Graduate students conduct their research only with permission, and managers screen volunteers carefully. As well as monitoring wildlife, workers must keep household, airstrip and boat systems running. In addition, both the workers and the wildlife on Tern Island serve as ambassadors for Hawaii's remote island refuge system. Jean-Michel Cousteau paid a visit last fall, and the voyaging canoe Hokule'a is expected to stop at Tern during its current trip. People work hard on Tern Island, but most consider it a fair exchange for the rare privilege of working with Hawaii's seals, turtles and seabirds. Occasionally, there are other rewards. Biologists Cari and Chris Eggleston met while working on Tern, Chris as an employee, Cari as a volunteer. They later married. Cari's family no longer wonders why she likes Tern Island. 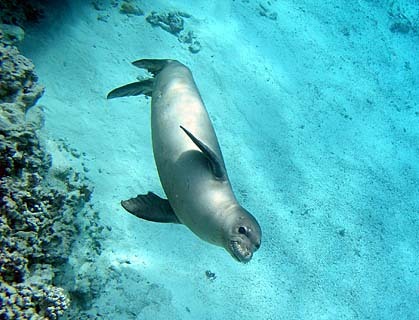 A Hawaiian monk seal pup checks out several divers in French Frigate Shoals Atoll. It is illegal to approach these endangered seals, but curious young seals often approach humans. In November, a crew of eight workers arrived at Tern Island to make repairs to the barracks and other systems. After the first day of work, biologists took the team snorkeling. When the group emerged, worker Cathy Storm said, "I saw a shark!" FWS biologist Alex Wegmann nodded. "I counted seven." "Seven!" she said. "When you said we were going snorkeling, you didn't mention sharks." "Sorry," said Wegmann. "I forgot." That's snorkeling at Tern Island. Hawaii's underwater marine life is so naturally abundant in and around this refuge field station, workers living there quickly forget that this is unusual. Besides swimming with sharks, snorkeling in this refuge offers other thrills. 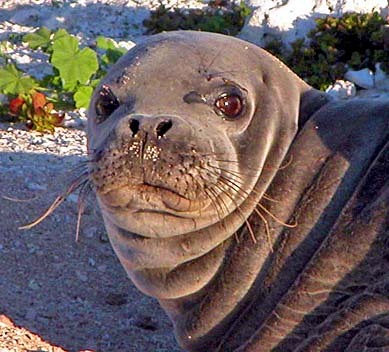 Since this is one of the few places Hawaiian monk seals breed, it's common to see a gray whiskered face with big round eyes peeking from behind a coral head. These are usually seals less than a year old, curious as puppies. Other snorkeling trips in this refuge, where fishing is not allowed, remind people that Hawaii's shorelines once teemed with large fish. "Bring a three-prong (spear)," teases construction worker Walter Nunuha of Kalihi as he prepares to go snorkeling with biologists. Nunuha's eyes widen as he sees an 80-pound ulua (jack) cruising next to swimmers. "So many big fish," he says. "You got lobsters, too?" "Yes," a biologist tells him, "but the seals eat lobsters. The lobsters here are theirs." "What, all of them?" he asks. She nods. "All of them." Later, Nunuha snaps pictures of moi and aholehole at the shoreline. "There used to be fish like this on Oahu," Nunuha says wistfully. "No more."